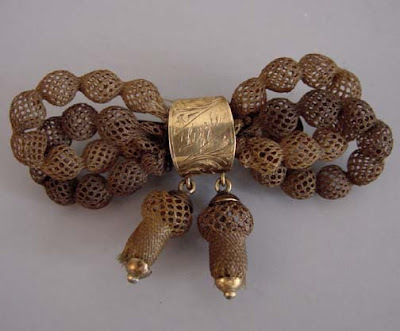 This piece of jewelry is as fascinating today as when it was made in the late 1800s. 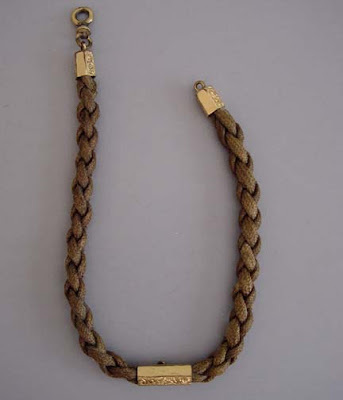 Intricate braiding and weaving of human hair became fashionable in the mid to late 1800s -the Victorian era. The watch chain shows that jewelry pieces were not made just for women. 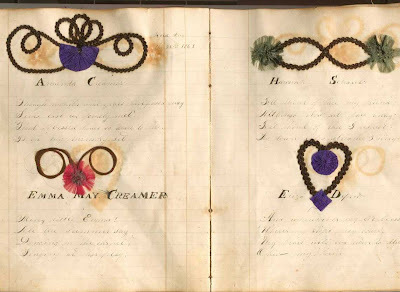 Endearments of love, hair weaving became a common parlor activity along with crocheting and knitting in Victorian times. 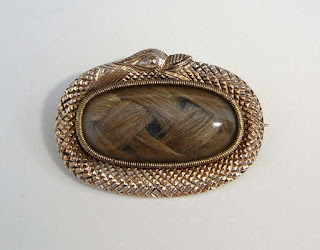 It was common for mothers to have a brooch containing the hair of their children . Have you ever wondered why baby albums have a place for a lock of hair? This is a vestige of the ornate practice almost lost after the turn of the 20th century. 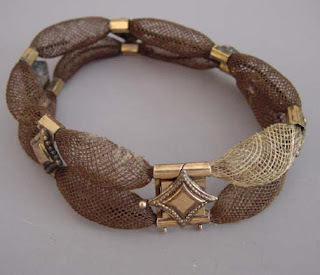 But often, the jewelry was made as a reminder of the loved one when separated due to war or death. Some people kept hair albums. This one belongs to Marlys Fladeland. Hair from loved ones would be intricately braided and kept in book form. Typically, when married, husband and wives hair would be braided together. All pictures shown represent human hair work, you can still find artists today working with human and horse hair. 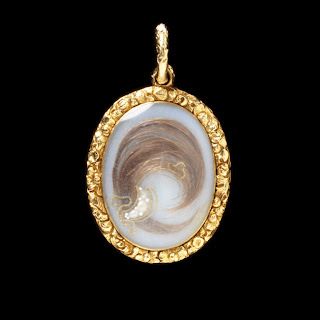 Other endearments preceding hairwork included the "lovers eye" jewelry. This piece is modern made by artist Tabitha Vevers. Endearments ...reminders of someone removed by time or distance made into works of art. Both lover's eyes and hairwork were worn close to the heart for sentimental reasons. These pieces are the results of art and passion intertwined just as the strands of hair were intertwined to make intimate endearments. What endearments do you have that have been handed down through your family? I was intrigued with how quickly the fad for hairwork rose and fell, and found some information in old publications - apparently it became so in vogue, that people were sending their hair off to be worked, and it was occasionally mixed or replaced with hair from other people, or lost entirely - and by the turn of the century it had almost completely gone out of fashion. ah, how timely! i have been researching the techniques involved in the creation of a family piece- it looks like a dried flower arrangement n a hexagonal frame, but it's a sampler of family hair, made by my great great grandmother during the civil war. and you already know how i feel about lover's eyes! Thanks so much for the link and information on hairwork. You are too cool...working with beetle wings AND hair! I do love tedious tasks myself. I saw many photos of hair woven to mimic a dried flower arrangement but did not include any of those photos in this post. I hope some of the links and info can help with your search. I wish I owned an heirloom of hairwork! I am glad this was a good memory for you! 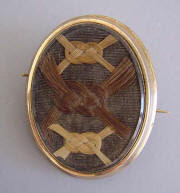 I don't have hairwork, but I do have a piece of Victorian mourning jewelry. It is onyx surrounded by baby pearls and set with three diamonds in the center. Each diamond represents a lost loved one. It came from my husband's family. His grandmother sadly was the one to add the third diamond. She wore it always. 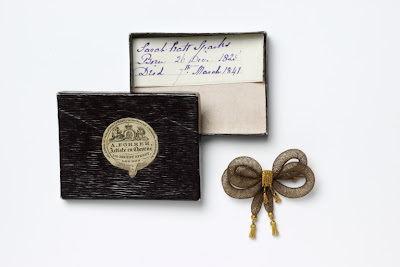 Mourning jewelry is closely linked to hairwork. I love to know the story behind everything! How can anyone own something that is "new" and made of resin or plastic that has no history? Thank you Jermaine! Your new post on grain sacks is amazing! You've found some wonderful examples. These are mind-boggling. I saw a piece in the Musee Carnavelet that had the hair of Marie-Antoinette and Louis XVI (and I think their children too). It made me shudder. I now sometimes think that I need to get a lock of hair from everyone I love...and I probably will. I found three of my sweet cat's whiskers on the rug after he died and I keep them in a special box and touch them sometimes. It really is a way to keep someone close to you forever. 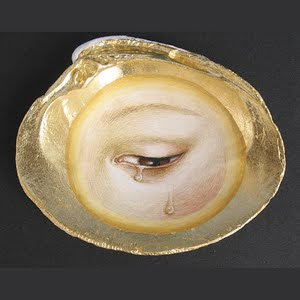 I have a little picture frame broach, too, with a painting of an eye. We certainly are fascinated by the same things! Oh Catherine.....I collect my cat's whiskers too....also lichens and unusual bird feathers.....maybe too much information? LOL! I'm so glad you found my blog because I love yours!! I'm going to have a long look see now. Thanks Terri! There are so many great blogs out there...I love stumbling into a good one! Oh Lala! I am leaving this technique to the experts. I do enjoy posting about forgotten art though. Can someone please direct me to videos or books for learning this craft. I have very long hair, which I have been saving for years.